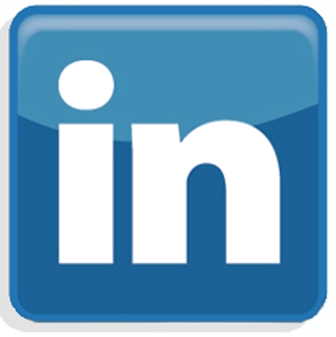 The GIMHA is also on Facebook, on Twitter and on Linkedin. If you are interested in obtaining any other documents corresponding to previous years, please do not hesitate to contact us. Romero-Cuéllar J., Abbruzzo A., Adelfio G., Francés F. 2018. 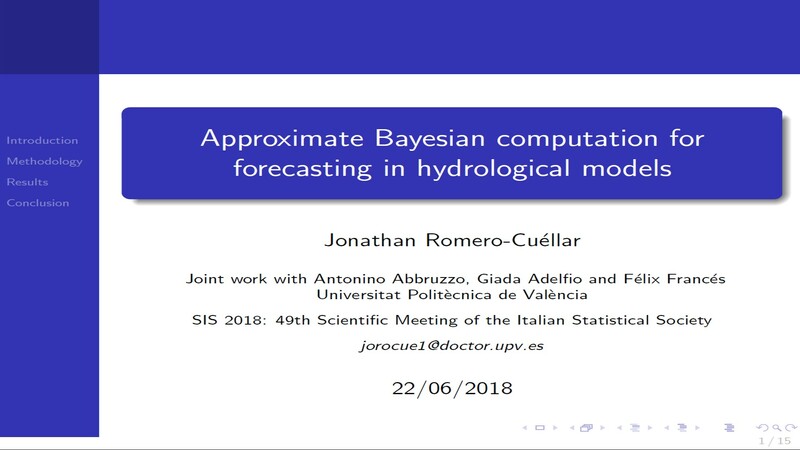 Approximate Bayesian computation for forecasting in hydrological models.. SIS 2018: 49th Scientific Meeting of the Italian Statistical Society, from 20 to 22 June 2018 at Palermo, Italy. Romero C., Puertes C., Quintanilla I., Francés F. 2018. 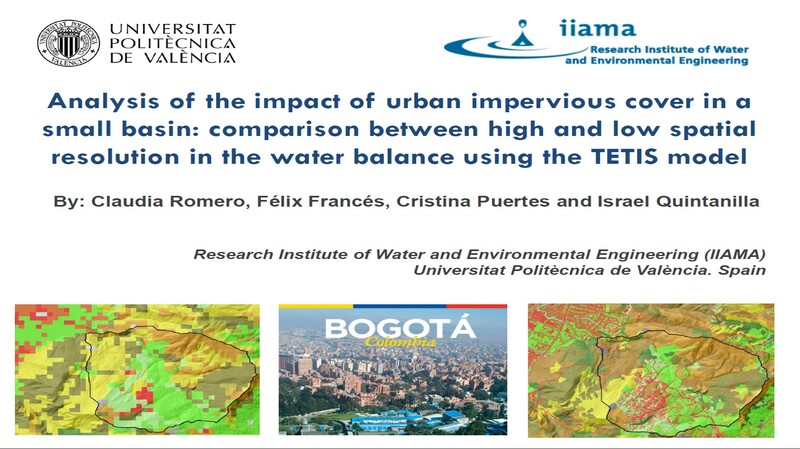 Analysis of the impact of urban impervious cover in a small basin: comparison between high and low spatial resolution in the water cycle using the TETIS model.. EGU Meeting 2018, from 23 to 28 April 2018 at Vienna, Austria. Romero-Cuéllar J., Siswanto Y., Adelfio G., Francés F. 2018. 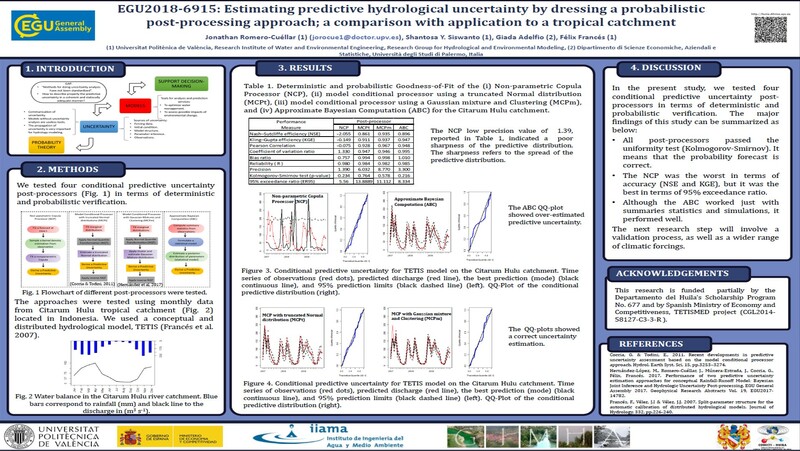 Estimating predictive hydrological uncertainty by dressing a probabilistic post-processing approach; a comparison with application to a tropical catchment.. EGU Meeting 2018, from 23 to 28 April 2018 at Vienna, Austria. Echeverría C., Ruiz-Pérez G., Francés F. 2018. 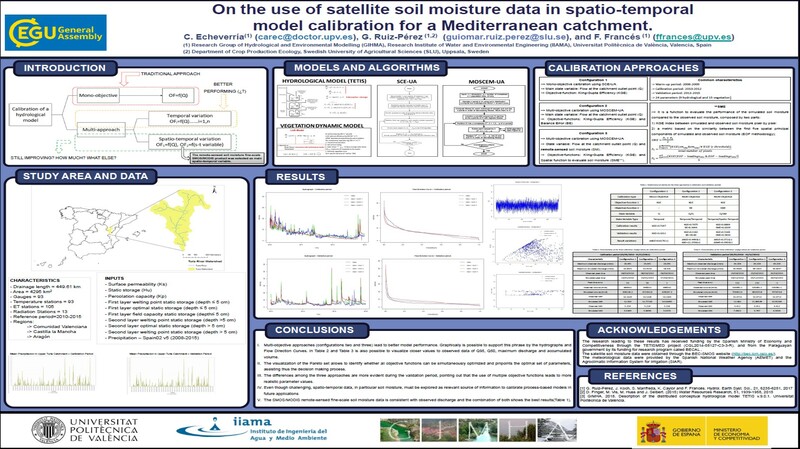 On the use of satellite soil moisture data in spatio-temporal model calibration for Mediterranean catchments.. EGU Meeting 2018, from 23 to 28 April 2018 at Vienna, Austria. Puertes C., Bautista I., Lidón A., Francés F. 2018. 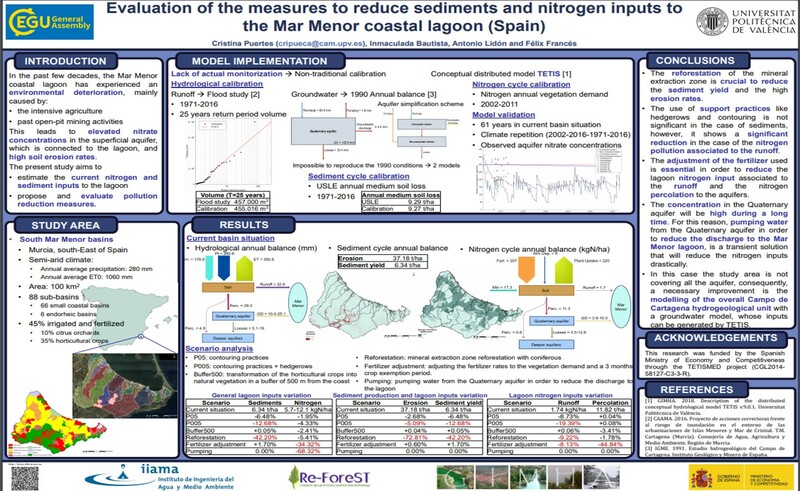 Evaluation of the measures to reduce sediments and nitrogen inputs to the Mar Menor coastal lagoon (Spain). EGU Meeting 2018, from 23 to 28 April 2018 at Vienna, Austria. García-Arias A., Segarra J., Francés F. 2017. 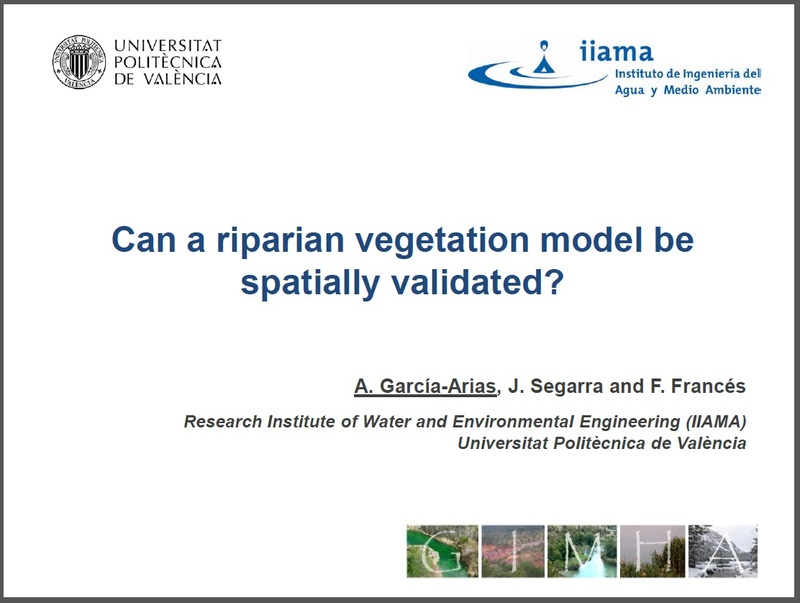 Can a riparian vegetation model be spatially validated?. HydroEco 2017 - 6th International Multidisciplinary Conference on Hydrology and Ecology. Ecohydrology on the edge: ecology-hydrology-human interactions in a changing world, from the 18th to 23rd of June, 2017 at Birmingham, United Kingdom. García-Arias A., Ruiz-Pérez G., Francés F. 2017. Are ecological and hydrological dynamics important in modelling ecohydrological processes?. HydroEco 2017 - 6th International Multidisciplinary Conference on Hydrology and Ecology. Ecohydrology on the edge: ecology-hydrology-human interactions in a changing world, from the 18th to 23rd of June, 2017 at Birmingham, United Kingdom. Yudha Siswanto S., Francés F. 2017. 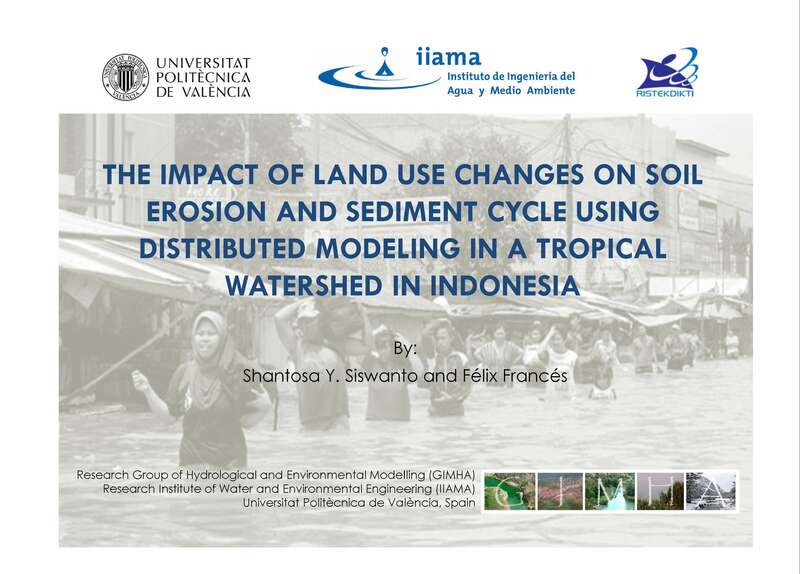 The Impact of Land Use Changes on Soil Erosion and Sediment Cycle Using Distributed Model in a Tropical Watershed in Indonesia. EGU Meeting 2017, from 23 to 28 April 2017 at Vienna, Austria. García-Arias A., Ruiz-Pérez G., Francés F. 2017. Importance of ecohydrological modelling approaches in the prediction of plant behaviour and water balance at different scales. EGU Meeting 2017, from 23 to 28 April 2017 at Vienna, Austria. García-Arias A., Romero Hernández C.P., Francés F. 2017. Relevance of the land use changes related to a megacity development in a Colombian river basin. EGU Meeting 2017, from 23 to 28 April 2017 at Vienna, Austria. Puertes C., González-Sanchis M., Lidón A., Bautista I., Lull C., Francés F. 2017 Carbon-nitrogen-water interactions: is model parsimony fruitful?. EGU Meeting 2017, from 23 to 28 April 2017 at Vienna, Austria. Hernández-López MR., Romero-Cuéllar J., Múnera-Estrada JC., Coccia G., Francés F. 2017. Comparison of Bayesian Joint Interference versus Model Conditional Processor approaches for quantification of hydrological uncertainly. EGU Meeting 2017, from 23 to 28 April 2017 at Vienna, Austria. Ruiz-Pérez G., Koach J., Manfreda S, Caylor K, Francés F. 2016. Automatic calibration of a parsimonious ecohydrological model in a sparse basin using the spatio-temporal variation of the NDVI. EGU Meeting 2016, from 17 to 22 April 2016 at Vienna, Austria. Puertes C., Francés F. 2016. How important are sediments in the flood peaks generated by a Mediterranean Catchment?. EGU Meeting 2016, from 17 to 22 April 2016 at Vienna, Austria. Echevería C., Ruiz-Pérez G., Francés F. 2016. How relevant is the interannual vegetation’s dynamic in the water cycle at catchment scale?. EGU Meeting 2016, from 17 to 22 April 2016 at Vienna, Austria. Ruiz-Pérez G., Manfreda S, Caylor K, Francés F. 2016. On the use of satellite data to implement a parsimonious ecohydrological model in the upper Ewaso Ngiro river basin. AGU Fall Meeting 2015, from 14 to 18 December 2016 at San Francisco. Ruiz-Pérez G., González-Sanchís M., del Campo A., Francés F. 2015. Mediterranean vegetation-water interactions: a model comparison at different complexity levels. 3IAHR 2015 - IAHR World Congress: Deltas of the future and what happens upstream, from 28 June to 3 July 2015 at The Hague, the Netherlands. Ruiz-Pérez G., González-Sanchís M., del Campo A., Francés F. 2015. On the use of satellite data to implement a distributed dynamic vegetation model in a Mediterranean catchment. International Union of Geodesy and Geophysics. IAHS (Hydrology), HW19 Remote Sensing Retrievals of Precipitation and Evapotranspiration. June 25, 08:30 - 10:00. Abstract IUGG-2705. Hernández MR, Francés F. 2015. Improving the bayesian joint inference through the inclusion of hydrological state variables in the residuals dependence model. International Union of Geodesy and Geophysics. IAHS (Hydrology), workshop HW13 Hydrological Predictions in Ungauged Basins. June 23, 13:30 - 15:00. Abstract IUGG-3515. Peña LE, Francés F, Barrios MI. 2015. Scaling behavior in the relationship between land use changes and flood regime. International Union of Geodesy and Geophysics, 26th IUGG General Assembly 2015, Prague, Czech Republic, 22 June - July 2 2015. Hydrologic Non-Stationarity and Extrapolating Models to Predict the Future, Abstracts HS02p-31, Abstract and Poster presentation. Session HS02 Category IAHS (Hydrology), Saturday, 27 June 2015, 15:00-16:30. Poster HS02p-031. García-Arias A, Francés F. 2015. Dynamics of riparian plant communities, a new integrative ecohydrological modelling approach. European Geosciences Union General Assembly 2015. Vienna, 12-17 April 2015. Geophysical Research Abstracts, Vol. 17, EGU2015-3202, (ISSN:1029-7006). Poster presentation: Session HS10.9, Friday, 17 April 2015, 13:30-15:00. Poster R251. Peña Rojas LE, Francés F, Barrios Peña M. 2015. Scaling the flood regime with the soil hydraulic properties of the catchment. European Geosciences Union General Assembly 2015. Vienna, 12-17 April 2015. Geophysical Research Abstracts, Vol. 17, EGU2015-7833 (ISSN:1029-7006). Poster presentation: Session HS5.7, Thursday, 16 April 2015, 17:30-19:00. Poster R75. Hernández MR, Francés F. 2015. On how to avoid input and structural uncertainties corrupt the inference of hydrological parameters using a bayesian framework. European Geosciences Union General Assembly 2015. Vienna, 12-17 April 2015. Geophysical Research Abstracts, Vol. 17, EGU2015-2394, (ISSN:1029-7006). Oral presentation: Session HS1.7, Monday, 13 April 2015, 10:45-11:00. García-Arias A, Francés F. 2015. Modelling hydroecological processes to determine riparian vegetation dynamics. HydroEco'2015 - 5th International Multidisciplinary Conference on HYDROLOGY and ECOLOGY: Advances in Monitoring, Predicting and Managing Hydroecological Processes. Vienna, Austria, 13-16 April 2015. Oral presentation: Session S14 Hydroecological processes in semi-arid regions, Wednesday, 15 April 2015, 17:00-17:15. Peña L.E., Francés F., Barrios M.I. 2015. Effects of the change of land use in discharge patterns using distribuited hydrological modelling in a tropical watershed. Oral presentation at the Third International Conference on Water, Energy and Environmental (ICWEE). American University of Sharjah, Sharjah - United Arab Emirates. ISBN 978-9948-22-718-2. Pp 49. Ruiz-Pérez G., González-Sanchís M., del Campo A., Francés F. 2015. Interacciones bosque-agua en la región Mediterránea: comparación de modelos a diferentes escalas. Oral presentation at the III Reunión grupo de trabajo hidrología forestal de la Sociedad Española de Ciencias Forestales. Valencia, Spain, March 9-11, 2015. Ruiz-Pérez G., Medici C., González-Sanchís M., García-Prats A., del Campo A., Francés F. 2014. Mediterranean Vegetation-Water interactions. A model comparison at different scales. Oral presentation at the XXIV IUFRO World Congress - Sustaining Forests, Sustaining People: The Role of Research. Utah, USA. October 5-11, 2014. Orozco I., Francés F. 2014. Efecto de la variabilidad de los factores de fusión en la modelación hidrológica de cuencas de alta montaña Oral presentation at the XXVI Congreso Latinoamericano de Hidráulica. Santiago de Chile, Chile, August 25-29, 2014. Ruiz-Pérez G., Medici C., González-Sanchís M., del Campo A., Francés F. 2014. On the importance of remote sensing data to validate a dynamic vegetation model applied to a semi-arid basin. Oral presentation at the 11th International Conference on Hydroinformatics. "Informatics and the Environment: Data and Model Integration in a Heterogeneous Hydro World". New York, USA. August 17-21, 2014. Hernández MR., Francés F. 2014. On the influence of error model in the good performance of the hydrological model for the right reasons. Oral presentation at the 11th International Conference on Hydroinformatics. "Informatics and the Environment: Data and Model Integration in a Heterogeneous Hydro World". New York, USA. August 17-21, 2014. Ruiz-Pérez G., Pasquato M., Medici C., González-Sanchís M., Molina A., Fernándes T.G.J., del Campo A., Francés F. 2014. Application of a simple dynamic vegetation model to an experimental plot and validation through satellite data and field observations. Geophysical Research Abstracts, Vol. 16, EGU2014-630 (ISSN:1029-7006). Conference session: HS6.8. Poster R353. European Geosciences Union General Assembly 2014. Vienna, Austria. 27 April - 02 May 2014. Bussi G., Francés F. 2014. Full implementation of a distributed hydrological model based on check dam trapped sediment volumes. Geophysical Research Abstracts, Vol. 16, EGU2014-3526 (ISSN:1029-7006). Conference session: SSS2.7. Poster B191. European Geosciences Union General Assembly 2014. Vienna, Austria. 27 April - 02 May 2014. García-Arias A., Francés F. 2014. Synergies and inconsistencies between two modelling approaches to predict the vegetation dynamic distribution in riparian semi-arid environments (Solicited poster). Geophysical Research Abstracts, Vol. 16, EGU2014-1024 (ISSN:1029-7006). Conference session: HS10.8. Poster R428. European Geosciences Union General Assembly 2014. Vienna, Austria. 27 April - 02 May 2014. Solera A., Segura C., Bussi G., Momblanch A., Francés F. 2014. Integrated analysis of the climate change effects on water availability for catchment management. The case of the Ésera River (Spain) Geophysical Research Abstracts, Vol. 16, EGU2014-15264 (ISSN:1029-7006). Conference session: HS5.3. Poster R288. European Geosciences Union General Assembly 2014. Vienna, Austria. 27 April - 02 May 2014. Ruiz-Pérez G., Pasquato M., Medici C., González-Sanchis M., Molina A., Fernándes T.J.G, del Campo A., Francés F., 2014. Using satellite-based remote sensing data and field measurements to validate a dynamic vegetation model implemented in a water-controlled catchement. Global Vegetation Monitoring and Modeling (GV2M). Avignon, France, from February 3rd to 7th, 2014. Francés F. 2013. Avances en la modelización hidrológica de la peligrosidad de inundación. Invited presentation at the III Jornadas de Ingeniería del Agua (JIA 2013) - La protección contra los riesgos hídricos. Valencia (Spain), October 23 and 24, 2013. Bussi G., Horel E., Francés F. 2013. Análisis del impacto del cambio climático en el ciclo de sedimentos de la cuenca del río Ésera (Pirineo Aragonés). Oral presentation at the III Jornadas de Ingeniería del Agua (JIA 2013) - La protección contra los riesgos hídricos. Valencia (Spain), October 23 and 24, 2013. Ruiz Pérez G., Medici C., Latron J., Llorens P., Gallart F., Francés F. 2013. ¿Heterogeneidad espacial o no-linealidad en los procesos? Análisis en una pequeña cuenca Mediterránea. Poster presentation at the III Jornadas de Ingeniería del Agua (JIA 2013) - La protección contra los riesgos hídricos. Valencia (Spain), October 23 and 24, 2013. Hernández M. R., Francés F. 2013. Análisis de sensibilidad global multivariado de los parámetros del modelo hidrológico distribuido TETIS, mediante un método bayesiano formal, con muestreo Monte Carlo guiado por una cadena de Markov. Oral presentation at the III Jornadas de Ingeniería del Agua (JIA 2013) - La protección contra los riesgos hídricos. Valencia (Spain), October 23 and 24, 2013. Orozco Medina I., Camarero Galindo L., Butturini A., Francés F. 2013. Variabilidad espacial y temporal de los factores grado-día de fusión de nieve en una cuenca mediterránea. Poster presentation at the III Jornadas de Ingeniería del Agua (JIA 2013) - La protección contra los riesgos hídricos. Valencia (Spain), October 23 and 24, 2013. López J., Francés F. 2013. La variabilidad climática de baja frecuencia y los cambios inducidos por embalses en la modelación no estacionaria de la frecuencia de crecidas en la España peninsular. Oral presentation at the III Jornadas de Ingeniería del Agua (JIA 2013) - La protección contra los riesgos hídricos. Valencia (Spain), October 23 and 24, 2013. Salazar S., Francés F. 2013. Análisis de la efectividad de diferentes estrategias para la reducción del riesgo de inundación incrementando la capacidad de retención del agua en el territorio. Poster presentation at the III Jornadas de Ingeniería del Agua (JIA 2013) - La protección contra los riesgos hídricos. Valencia (Spain), October 23 and 24, 2013. F. Francés, G. Bussi, L. Ramírez and E. Horel. 45 minutes invited presentation: Modelización distribuida del ciclo de sedimentos: aplicación al análisis del efecto del cambio climático en el aterramiento del embalse de Barasona (España) Seminario Internacional sobre Integración de modelos y análisis de datos para modelación hidrológica. Universidad de Medellín, Medellín (Colombia). September 11-13, 2013. F. Francés, G. Bussi, R. García Bartual, J.L. Salinas, E. Hernández, L. Pujol, V. Guna, E. Ortiz and V. Bellver. Ponencia invitada de 30 minutos: Evaluación avanzada de la peligrosidad y del riesgo de inundación. Encuentro Regional del Agua. Universidad de Medellín, Medellín (Colombia). September 11-13, 2013. A. Ruhí, I. Muñoz, E. Tornés, R. Batalla, D. Vericat, L. Ponsatí, V. Acuña, D. von Schiller, G. Bussi, F. Francés, S. Sabater. 2013. How does hydrological and habitat heterogeneity affect food chain length and community structure in Mediterranean streams? 8th Symposyum for European Freshwater Sciences (SEFS). Münster, Germany. July, 2013. G. Ruiz Pérez, C. Medici, J. Latron, P. Llorens, F. Gallart and F. Francés. Importance of the spatial heterogeneity in the non-linear response of a small Mediterranean catchment. International Symposium on Distributed Hydrological Modelling. To mark the 70th birthday of Prof. Ezio Todini. Bologna (Italy), June 5-7, 2013. Mario R. Hernández and Félix Francés. An incipient uncertainty analysis in hydrological modeling... EAWAG 5th Summer School in Environmental Systems Analysis. Dübendorf, Switzerland. From 3 to 7 June, 2013. Gianbattista Bussi and Félix Francés. Hydrological and sediment model calibration at ungauged basins using check dam stratigraphy as proxy data in a Mediterranean catchment. 6th International Conference on Water Resources and Environment Research (ICWRER 2013). Koblenz, Germany. From 3 to 7 June, 2013. Gianbattista Bussi, Félix Francés, José Andrés López-Tarazón, Ramón J. Batalla. Modelling sediment yield of a highly erodible catchment based on reservoir siltation volumes.. Geophysical Research Abstracts Vol. 15, EGU2013-6853, 2013. EGU General Assembly 2013. Vienna (Austria), 07 - 12 April 2013. Guiomar Ruiz Pérez, Chiara Medici, Jérôme Latron, Pilar Llorens, Francesc Gallart and Félix Francés. Importance of the spatial heterogeneity in the non-linear response of a small Mediterranean catchment.. Geophysical Research Abstracts Vol. 15, EGU2013-6859, 2013. EGU General Assembly 2013. Vienna (Austria), 07 - 12 April 2013. Marta Pasquato, Chiara Medici, Andrew D. Friend and Félix Francés. Comparing modelled and remotely sensed leaf area dynamics in an Aleppo pine semiarid forest.. Geophysical Research Abstracts Vol. 15, EGU2013-1863, 2013. EGU General Assembly 2013. Vienna (Austria), 07 - 12 April 2013. Múnera J.C., Francés F.,Todini E. Predictive uncertainty estimation at ungauged basins in a Bayesian framework.. PUB Symposium 2012. Completion of the IAHS decade on Prediction in Ungauged Basins and the way ahead. Delft, October 23-25, 2012. Bussi G., Francés F., Rodríguez Lloveras X., Benito G., Sánchez Moya Y., Sopeña A. Calibration of a hydrological model using sediment proxy data.. PUB Symposium 2012. Completion of the IAHS decade on Prediction in Ungauged Basins and the way ahead. Delft, October 23-25, 2012. López J., Francés F. 2012. Non-stationary flood frequency analysis in continental Spanish rivers using climate and reservoir indexes as external covariates. 3rd STAHY International Workshop on Statistical Methods for Hydrology and Water Resources Management. Tunis, Tunisia. 1-2 October 2012. Rodríguez Lloveras X., Bussi G., Sánchez Moya Y., Sopeña A., Francés F., Benito G. 2012. Approach to the sediment production rates through the check dams retention capacity in ephemeral Mediterranean rivers. XII Reunión Nacional de Geomorfología. Santander, Spain. 17-20 September, 2012. Conference proceedings ISBN 978-84-86116-54-5. Bussi G, Francés F, Salinas JL, García-Bartual R, Pujol L, Guna V, Ortiz E. 2012. Estimación de mapas de peligrosidad mediante generación de tormentas sintéticas XXV Congreso Latinoamericano de Hidráulica 2012. San José, Costa Rica. 9-12 September, 2012. Conference proceedings ISBN 978-9968-933-06-3. Ramos L., Francés F. 2012. Propagación del Error de la Lluvia Estimada por Satélite en la Modelación Hidrológica en una Cuenca Extratropical Mediterránea XXV Congreso Latinoamericano de Hidráulica 2012. San José, Costa Rica. 9-12 September, 2012. Conference proceedings ISBN 978-9968-933-06-3. Medici C., Wade A.J., Francés F. 2012. Does increased hydrochemical model complexity decrease robustness? Catchment Change Network (CCN) Conference: Stakeholders, next generation models, and risk in managing catchment. Celebratory Workshop GLUE: 20 years on. Lancaster University, UK. 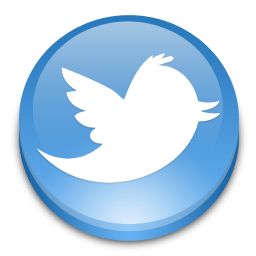 25th June-27th June 2012. Francés F. 2012. La Modelación Matemática de la Peligrosidad de Inundación en el Siglo XXI. Lecture given by D. Félix Francés García, awarded in the category of Confirmed Researcher. Cycle of Conferences for Innovation in Engineering organised by the Colegio de Ingenieros de Caminos, Canales y Puertos. Valencia (Spain). February 14, 2012. Barrios M., Francés F. 2011. Application of scaling equations to deal with the spatial aggregation effect on watershed hydrological modelling. SCARCE 2nd ANNUAL CONFERENCE: Integrated modelling and monitoring at different river basin scales. Universidad Politécnica de Madrid, Madrid (Spain), 28-29 November, 2011. Múnera J. C., Francés F. , Todini E. 2011. Uncertainty assessment of streamflow simulation on ungauged catchments using a distributed model and the Kalman filter based MISP algorithm. FLOODS IN 3D: PROCESSES, PATTERNS, PREDICTIONS. EGU 2011 Leonardo Conference. Bratislava, Slovakia, 23-25 November 2011. Conference program. F. Francés, B. Botero. 2011. Probable Maximum Flood estimation using upper bounded statistical models and its effect on high return period quantiles. 3rd International Week on Risk Analysis, Dam Safety, Dam Security, and Critical Infrastructure Management. Valencia, Spain, October 18-19, 2011. F. Francés, R. García-Bartual, G. Bussi. 2011. High return period annual maximum reservoir water level quantiles estimation using synthetic generated flood events. 3rd International Week on Risk Analysis, Dam Safety, Dam Security, and Critical Infrastructure Management. Valencia, Spain, October 18-19, 2011. M. Pasquato, C. Medici, F. Francés. 2011. Aplicación de un modelo conceptual distribuido de vegetación dinámica a una cuenca semiárida del sureste de España. Jornadas de Investigación en la Zona no Saturada del Suelo. Estudios en la zona no saturada del suelo. Volumen X, ZNS 11. ISBN: 978-84-694-6642-1. Universidad de Salamanca. Salamanca, Spain. 19-21 October 2011. A. García-Arias, F. Francés. 2011. Efectos de la regulación de caudales sobre la vegetación riparia en un entorno semiárido. I Iberian Congress on River Restoration "RestauraRíos". León, Spain. 18-20 October 2011. Book of communications, p. 658-666. ISBN: 978-84-694-9905-4. J. C. Múnera, F. Francés, E. Todini, G. Coccia. 2011. Evaluación de la incertidumbre en la simulación de caudales en puntos no aforados con un modelo distribuido y mediante un procesador estocástico. II Jornadas de Ingeniería del Agua "Modelos Numéricos en Dinámica Fluvial". Barcelona, Spain. 5-6 October, 2011. ISBN-13: 978-84-615-4023-5. F. Francés, R. García-Bartual, G. Bussi, J. L. Salinas, E. Fernández. 2011. Diseño hidrológico de alto período de retorno mediante generación sintética de eventos de crecida. II Jornadas de Ingeniería del Agua "Modelos Numéricos en Dinámica Fluvial". Barcelona, Spain. 5-6 October, 2011. ISBN-13: 978-84-615-4023-5. E. Ortiz, F. Francés, G. Bussi, L. Pujol, R. Gabaldón, V. Guna, V. Bellver, J. Antón. 2011. Modelación hidráulica y análisis del riesgo de inundación según las líneas guía de la Directiva Marco del Agua. El caso de la Marina Alta y la Marina Baja (Alicante). II Jornadas de Ingeniería del Agua "Modelos Numéricos en Dinámica Fluvial". Barcelona, Spain. 5-6 October, 2011. ISBN-13: 978-84-615-4023-5. A. García-Arias, F. Francés, I. Andrés-Doménech, F. Vallés, V. Garófano-Gómez and F. Martínez-Capel. 2011. Modelación dinámica de la vegetación de ribera. Calbración del modelo RIPFLOW y su aplicación en escenarios de regulación de caudales. II Jornadas de Ingeniería del Agua "Modelos Numéricos en Dinámica Fluvial". Barcelona, Spain. 5-6 October, 2011. ISBN-13: 978-84-615-4023-5. R. García-Bartual, F. Francés. 2011. Representación espacioa-temporal de la intensidad de lluvia para generación de escenarios de crecida de elevado periodo de retorno. II Jornadas de Ingeniería del Agua "Modelos Numéricos en Dinámica Fluvial". Barcelona, Spain. 5-6 October, 2011. ISBN-13: 978-84-615-4023-5. P. Arévalo, E. Ortiz, V. Guna, F. Francés, J. C. Múnera, J. Auñón, R. Martínez, D. Irles. 2011. Acople de modelos hidrológicos e hidráulicos para la determinación de la respuesta de entornos rural-urbano en un área endorreica. II Jornadas de Ingeniería del Agua "Modelos Numéricos en Dinámica Fluvial". Barcelona, Spain. 5-6 October, 2011. ISBN-13: 978-84-615-4023-5. García-Arias, A.; Francés, F.; Rivaes, R.; Rodríguez-González, P.; Albuquerque, A.; Ferreira, T.; Egger, G.; Politti, E. (2011). Analysis of the riparian vegetation dynamics through the RIPFLOW model. Climate change scenarios in three European countries. HydroEco 2011 3rd Int. Conference on Hydrology and Ecology: Ecosystems, Groundwater and Surface water. Pressures and Options. Session F, number 361. Volume of abstracts p. 141-142 (H. P. Nachtnebel & K. Kovar, Eds.). ISBN: 978-3-900962-95-1. Vienna (Austria), 2-5 May 2011. Marta Pasquato, Chiara Medici, and Félix Francés. Application of a conceptual distributed dynamic vegetation model to a semi-arid basin, SE of Spain. Geophysical Research Abstracts Vol. 13, EGU2011-10437, ISSN 1029-7006. EGU General Assembly 2011. Vienna, Austria. April, 2011. Felix Frances, Gregory Egger, Teresa Ferreira, Karoline Angermann, Francisco Martínez-Capel, and Emilio Politti. Riparian vegetation dynamic modelling using the succession-retrogression concept: the RIPFLOW project. Geophysical Research Abstracts Vol. 13, EGU2011-11851, ISSN 1029-7006. EGU General Assembly 2011. Vienna, Austria. April, 2011. Alicia García-Arias, Félix Francés, Francisco Martínez-Capel, Rui Rivaes, Patricia Rodríguez-González, Antonio Albuquerque, and Teresa Ferreira. Analysis of the riparian vegetation dynamics through the RIPFLOW model. Disturbed flow scenarios in Mediterranean rivers. Geophysical Research Abstracts Vol. 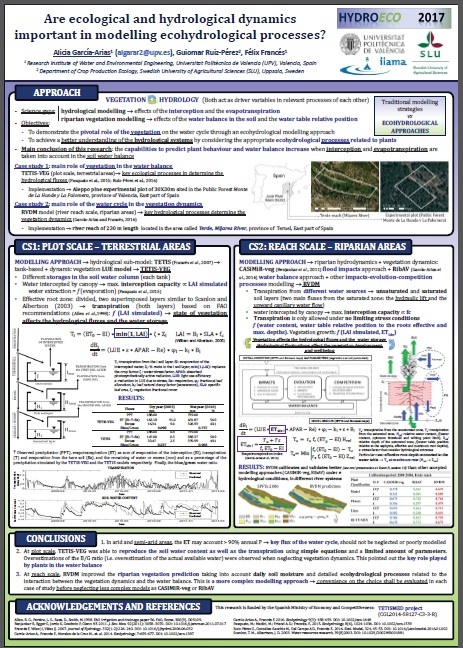 13, EGU2011-13084, ISSN 1029-7006. EGU General Assembly 2011. Vienna, Austria. April, 2011. Jesús López and Félix Francés. Possible influence of large-scale climate indices on the variability of maximum streamflow in rivers of Peninsular Spain. Geophysical Research Abstracts Vol. 13, EGU2011-13481, ISSN 1029-7006. EGU General Assembly 2011. Vienna, Austria. April, 2011. Lia Ramos Fernández and Félix Francés. Usefulness of rainfall estimated by remote sensing in hydrologic modeling applied to river basin Júcar in Spain. Geophysical Research Abstracts Vol. 13, EGU2011-9746, ISSN 1029-7006. EGU General Assembly 2011. Vienna, Austria. April, 2011. Gianbattista Bussi and Félix Francés. Calibration of TETIS-SED model by using check dams sedimentation volumes with different temporal resolutions. Application to a Mediterranean medium size basin (Rambla del Poyo, Spain). Geophysical Research Abstracts Vol. 13, EGU2011-4580, ISSN 1029-7006. EGU General Assembly 2011. Vienna, Austria. April, 2011. Miguel Barrios and Félix Francés. Parameterization of subgrid heterogeneities for hydrologic modelling. Geophysical Research Abstracts Vol. 13, EGU2011-12749, ISSN 1029-7006. EGU General Assembly 2011. Vienna, Austria. April, 2011. F. Francés, C. Medici, G. Bussi, A. García, M. Barrios and M. Pasquato. Distributed hydrological modelling within SCARCE Project: integrating water, sediment, quality and vegetation. 1st SCARCE ANNUAL CONFERENCE. Girona, España. Diciembre de 2010. Francés,F. ; Orozco, I. Automatic Calibration of a Distributed Rainfall-Runoff Model, Using the Degree-Day Formulation for Snow Melting, Within DMIP2 Project. American Geophysical Union, Fall Meeting December 2010, abstract #H23A-1173. Barrios, M.I. ; Orozco, I.; López, J.; Francés, F. Non-stationary effective parameters for distributed hydrological modeling EGU Leonardo Topical Conference Series on the hydrological cycle - 2010. Looking at catchment in colors. Luxembourg, 10-12 November 2010. Juan Camilo Múnera, Gabriele Coccia, Félix Francés, Ezio Todini. Aplicación de un procesador bayesiano para la evaluación de la incertidumbre predictiva mediante combinación de modelos hidrológicos en la predicción de crecidas en tiempo real. XXIV Congreso Latinoamericano de Hidráulica. Punta del Este, Uruguay. Noviembre de 2010. Jesús López, Félix Francés, Miguel Barrios, Ismael Orozco. Análisis espacio-temporal de la influencia de índices de teleconexión en los caudales máximos en la España peninsular XXIV Congreso Latinoamericano de Hidráulica. Punta del Este, Uruguay. Noviembre de 2010. Ismael Orozco, Félix Francés, Jesús López, Miguel I. Barrios. Modelación hidrológica distribuída en cuencas de alta montaña utilizando el modelo TETIS XXIV Congreso Latinoamericano de Hidráulica. Punta del Este, Uruguay. Noviembre de 2010. Lia Ramos, Félix Francés. Utilidad de la precipitación obtenida por satélite en la modelación hidrológica aplicada a la cuenca del río Júcar XXIV Congreso Latinoamericano de Hidráulica. Punta del Este, Uruguay. Noviembre de 2010. M. Barrios, I. Orozco, J. López, F. Francés. Influencia de momentos de segundo orden en el escalamiento espacial de parámetros hidrológicos XXIV Congreso Latinoamericano de Hidráulica. Punta del Este, Uruguay. Noviembre de 2010. Lia Ramos, Félix Francés. Calibración de un modelo hidrológico distribuído aplicado a la Cuenca del Río Júcar. Seminario Internacional de Medio Ambiente y Recursos Hídricos. Lima, Perú. Agosto de 2010. Alicia Garcia-Arias, Felix Frances. Evaluation of direct and indirect anthropic effects over riparian vegetation zonation in several stretches of Mediterranean rivers in Spain. Workshop Summer School "Advances in Ecohydrology". 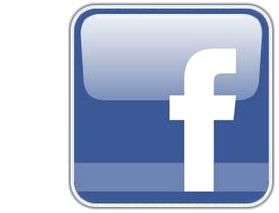 http://www.idra.unipa.it/summerschool/index.html. C. Medici, S. Bernal, A. Butturini, F. Sabater, M. Martin, A. J. Wade and F. Frances. Assessing nitrogen dynamics in a small Mediterranean forested catchment, Fuirosos (Catalonia). 20th SETAC European annual meeting. Sevilla, Spain. May 2010. M. Barrios y F. Francés. Análisis de Escalabilidad de parámetros hidrológicos con base en la variabilidad a escala puntual. 3rd Alban Conference. Oporto, Portugal 2009. C. Medici, A. Butturini, S. Bernal, F. Sabater, M. Martín, A.J. Wade and F. Francés. Application of a lumped nitrogen model to a small Mediterranean catchment, Fuirosos (Catalonia). Zona no Saturada 09, Estudios de la Zona No Saturada del Suelo, Vol. IX, ISBN 978-84-96736-83-2. C. Medici, A. Butturini, S. Bernal, E. Vázquez, F. Sabater, J.I. Vélez , F. Francés. Riparian Zone control on flow regime in a small Mediterranean forested catchment named Fuirosos, Catalonia (Spain). 7th International Symposium on Ecohydraulics 2009. Sergio Salazar y Félix Francés. Comparación de la eficiencia de mitigación de inundaciones mediante medidas de retención en el territorio. Proceeding of the XXIII Congreso Latinoamericano de Hidráulica, Cartagena de Indias, Colombia. 2-6 September, 2008. Tomo II, 213T9, ISBN:978-958-719-075-5. F. Francés, J.C. Múnera. Modelación hidrológica distribuida de la cuenca de los ríos Saja-Besaya con el modelo TETIS v.7.2, para estimación probabilística de avenidas en los períodos de estiaje. XXIII Congreso Latinoamericano de Hidráulica Cartagena de Indias (Colombia), 2008. C. Medici, A. Butturini, S. Bernal, F. Sabater, J.I. Vélez, F. Francés. Modelación hidrológica de una pequeña cuenca Mediterránea. XXIII Congreso Latino Americano de Hidráulica, Ed. XXIII Congreso Latino Americano de Hidráulica, Tomo I, 236T2. C. Medici, A. Butturini, F. Sabater, J.I. Vélez, F. Francés. Modelling the hydrological response of small Mediterranean forested catchment: exploring the potential influence of the riparian-stream connection. IV General Assembly of European Geosciences Union (EGU), Ed. Geophysical Research Abstracts en CD, Vol. 9, 05452, 2007. SRef-ID: 1607-7962/gra/EGU2007-A-05452. ISSN 1029-7006. R. García-Bartual, J.C. Múnera. A decision support tool for flash flood control in large dams. 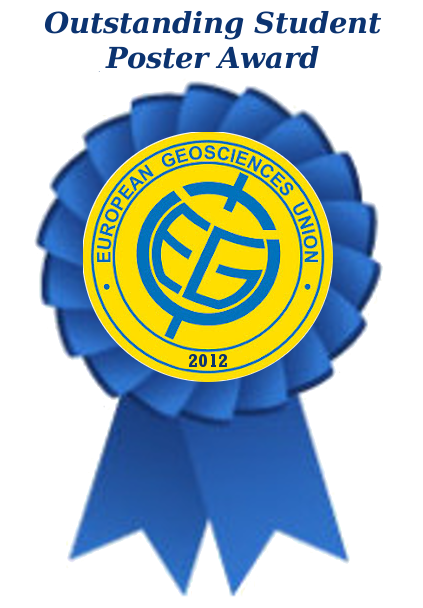 IV General Assembly of European Geosciences Union (EGU), Ed. Geophysical Research Abstracts, Vol. 9, 11012, 2007. SRef-ID: 1607-7962/gra/EGU2007-A-11012. ISSN 1029-7006.